Given the various strategic options available to banks, the biggest challenge posed by open banking is not technological or regulatory, but organisational. Business models, commercial strategies and operational practices must evolve. Some banks may choose to take a straight compliance approach to PSD2 and retain their existing role. There are opportunities, though, to explore new approaches. Banks can choose to be ‘distributors’, leveraging third-party services to enhance their product portfolio. They can also be ‘producers’ and develop their own services to be distributed by third-parties, extending the reach of their core products. Banks can also leverage and capitalise on easier access to data by becoming information ‘aggregators’ or ‘providers‘. 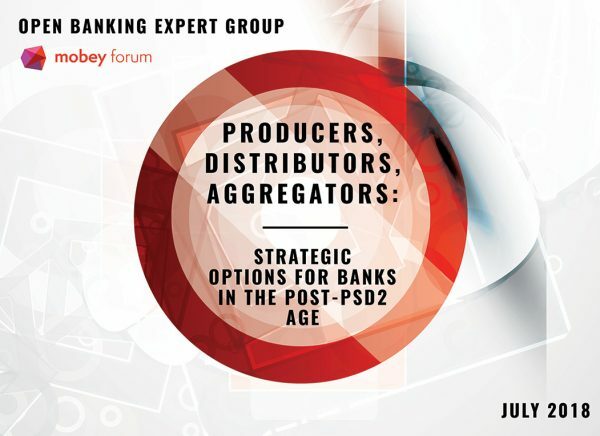 By clearly identifying potential roles and providing concrete examples of successful implementations, this report will help banks better understand the options available and the approaches they can pursue, enabling them to get ahead in the new API banking economy. This is the second report in a series of papers from Mobey Forum´s Open Banking Expert Group.